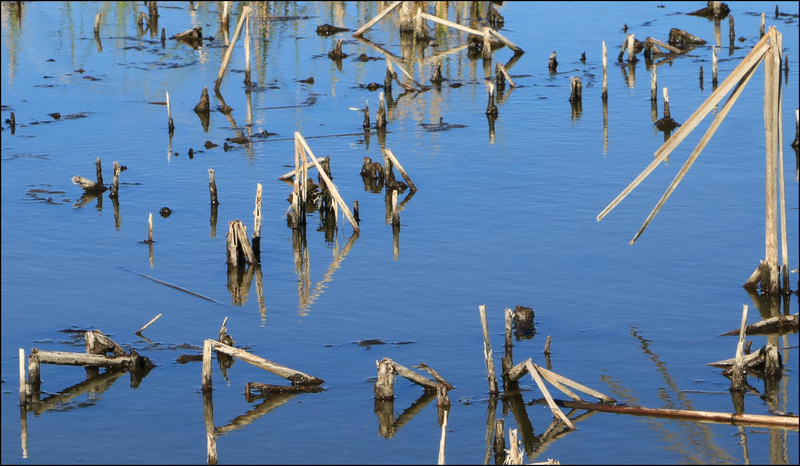 Even in the last stages of decay, broken reeds can delight the eye. At first I thought I was looking at the remains of a dock. It took me a while to realize what the elements actually are. I could have given a little more context, couldn’t I? I’ve changed the text a bit to make things more understandable. It’s a good reminder that not enough information can be as problematic as too much information. The post’s title initially led my mind in yet another direction, thanks to the famous Euclid of geometry. Just as the triangles formed by the broken reeds gave me the title. The place actually is known as Olney’s Pond. I like the bent branches and toasty limbs and foliage of plants at their end. To me, it signals nourishment for a renewal. Your photo captures that for me–lovely! It’s a wonderful little spot. When the piles of reeds were larger — back in June and July — they served as a nesting area for black-bellied whistling ducks and moorhens. I don’t have a photo of the plants green and growing, but as soon as I do, I think I’ll post a series of photos showing how the flora helps to support the fauna. Besides, who doesn’t like seeing babies? I like seeing them too. This time of year here they are sticking up through the ice. Like swizzle sticks in a fancy bar drink! When I was still in grade school, my folks used to bring me swizzle sticks after their New Year’s Eve parties. Maybe I need to take a closer look. There could be a party going on down at the pond! In another couple of weeks I will be able to see the party: turtles will be visible in their winter home beneath the ice. No kidding? For some reason I assumed they’d be buried in the mud, or something. When I asked the venerable Google, “How do turtles survive the winter?” I discovered I wasn’t alone. This article from North Country Public Radio explains it really well. I’ll try to remember to look for some when the ice gets a little thicker. The thicker the better. No turtle’s worth broken ice! They’re place-markers for where the new reeds will emerge come spring. I like the reeds against that very blue water. I’m trying to think of a shade of blue I don’t like, and I can’t think of one . . .
Maybe Nature is knitting together a new season, and has them tucked in as stitch markers. That’s a kind of place marker, right? Like you, I enjoy the blues in nature, and I especially like combinations of every shade of blue and brown. It took me a while to figure out that as pale as the browns are here, it’s still that lovely combination. Love the title and the natural geometry. In nature I see geometry everwhere in organic structures. I never used to, but it’s happening more often. In this photo, the reflections made the triangles explicit, and actually pretty hard to miss — although I remember a time when I would have missed them. Of course, I’m the one who took several decades to figure out that a square also is a rectangle, so there you are. I figured Euclid was a reference to angles, boy, that sent a chill down my spine, geometry was quite a swamp & morass for me in high school. My brain is a slender reed when it comes to math. But I like your angular picture! And if I ever get around to home-wine-making, the label will be Black-Bellied Whistling Cold Duck! The only thing I found worse than geometry was algebra — at least until I got into my general math class in college, and they were teaching the “new” math. I had a hard enough time with the old math. I find broken reeds fascinating. The same with mowed down cornstalks poking out of the snow. A combination of corn stalks and snow brings to mind pheasant hunting, not to mention going out into the fields just for fun, to see if we could flush some birds. Of course, that many years ago, there were farmers who’d leave a portion of the crop in the field for the birds. I wonder if anyone does that any more? One reason I like winter is because you can see so much more of the underlying structure. It’s not always as colorful, and often not nearly so pleasant (as you know!) but it still can be beautiful. I love the almost abstract feel to it, and would love to see you convert it to Black and White. And then if you reversed it (negative) you may even see some delightfully weird creatures. Your comment about weird creatures made me smile. There’s a “three-toed” reed near the bottom, just right of center, that made me think of a shorebird’s foot. What happened to the rest of him, I don’t know. It does have a bit of an abstract feel, doesn’t it? When I have a little time to play around, I might try it in black and white, just to see what it looks like. But I do love that sky-blued water. It’s not often our water’s that pretty. I wonder if the reeds were so in love with their own reflection that they looked a bit to deep into the pond and paid the price of their narcissism and therefore sadly broke. Or am seeing too much in this? Nature can be quite quirky, don’t you think? In any case, broken or not, they are giving us a lovely image, so all is forgiven. That’s an interesting interpretation, Gerard. Perhaps an alternate title for the image could be “Narcissus’s Revenge.” Or, it may just be that the poor reeds exhausted themselves with all that growing during the summer, and decided it was time to just it up: or down, as the case may be. If, as a child, Euclid had been presented to me in this format, I may have found geometry a wonderful experience instead of ‘torture’. When I put this image up on the computer, cropped it, and looked at that group of four reeds-and-reflections near the bottom, the first word that came to mind was, ” isosceles.” Apparently that word’s been lurking around in the recesses of my mind, just waiting for a chance to be helpful. Like you, I felt tortured in my math classes, but we may know more than we think we know. The trick is finding a way to release it. A couple of them look like they are talking to each other…maybe nature animates AI, too? Maybe that big one on the right is making a speech to the small ones on the left. Or, perhaps it’s a teacher, lecturing on reed-dom. There’s lots to see, and no end to possibilities for an active imagination. It is fairly shallow there, and the water’s fresh. Wouldn’t it be something to see ice there? Here, this would be a flooded cornfield after the harvest! Rarely do farmers completely empty their fields anymore (I think it’s called no-till). I much prefer thinking of this as a pond than a flooded field, though! I’m with you, Debbie. We’ve had enough of flooded fields around here for a while — although the truth is that we could use some good rain. Six inches would be good; we don’t need fifty. It does look like cornstalks, doesn’t it? We used to walk the fields after harvest to pick up ears that were lying around, then take them home and put them up for the squirrels, or shell them for other birds. I get cold just thinking about it. And if it isn’t precisely beautiful, it’s still interesting, and worthy of attention. Despite my gentle grumping about a lack of fall color, I do enjoy tracking the seasons — whatever they bring. I’ve always believed that geometrical design is ever so present in Nature, so much that humans copy from it constantly and continue to do so, but are often ashamed and rarely give credit to this inspiration source. And patterns in one part of nature often reveal themselves in another. Crystals come to mind, along with the dendritic structure of neurons and the Fibonacci sequence. I’m sure there are examples galore that I’m not aware of, but I do appreciate them when I’m able to see them — as with these reeds.